Murungai ilai / Drumstick leaves are known for its medicinal values . It aids in lowering blood sugar, cholestrol, and blood pressure. It is effective in treating anaemia as it is rich in iron. It aids in milk secretion for lactating mothers. Also it has enormous health benefits. You can google for it. To be precise it is nature's multi-vitamin. HOW TO CLEAN DRUMSTICK LEAVES EASILY? Many people do not buy these leaves because removing the leaves from the stalk is a troublesome job. To make it easy, just roll the drumstick leaves tightly in a newspaper and leave it overnight. The next day, tap it on the paper and leaves will shed by themselves. Discard the yellow leaves. After tapping like this, few very small stems can be removed easily. Left out tiny stems will stay at the bottom when washing the leaves. This is the easy way to clean drumstick leaves. 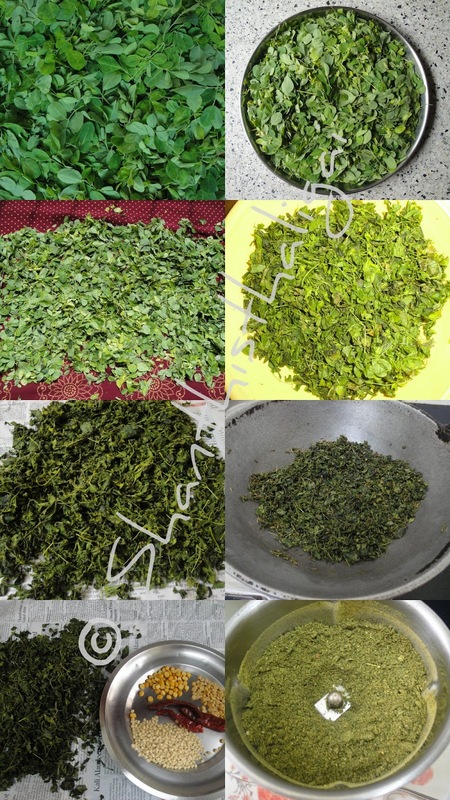 Murungai ilai podi (Drumstick leaves powder) can be made with more dhals, but I prefer to have it rich-green coloured, with more leaves, as I like the flavour of leaves to be more than the dhals. A fistful of leaves can be used if you want it like dhal powder. A big bunch of leaves bought will make only 1 or 2 cups after dried. Wash drumstick leaves, take just the leaves, discard the stem, pat them in a towel without water and dry it in shade, on a newspaper for a couple of hours. Heat oil in a pan and fry dhal and chillies until golden brown, transfer it to a plate. In the same pan, dry roast drumstick leaves until crisp and transfer to a plate OR microwave for a few minutes, stirring in between until dry. When cool, dry grind the dhals & chillies first coarsely. Add drumstick leaves and salt and grind to a fine powder. Store in an air-tight container. Tastes awesome with hot rice and ghee. Goes well with idli, dosa and curd rice as accompaniment. You can sprinkle this powder on dosas and eat like podi dosa. what an idea. Thanks for sharing. Drumstick leaves have wonderful medicinal properties. Gud idea Shanthi.